Chicago, you absolutely love craft beer. And for that reason, I love you. Chicago is loaded down with unique bars, restaurants and pubs. Some cater specifically to the craft beer snob, some are stereotypical dives or watering holes, and others are your run-of-the-mill restaurant with a handful of taps dominated by Budweiser and Coors. In part one of our Chicago brewtrip series, I take you on a tour of the standard venues to grab a pint. Every craft beer enthusiast ends up at a pub or two while on vacation. Chicago has an abundance of pubs and beer bars. Places like Hopleaf, Map Room and Beermiscuous top a lot of lists for locals and critics alike. We were trying to kill time before an architecture cruise (nerds!! ), so venturing too far wasn’t an option. We settled on Timothy O’Toole’s Pub simply because it was the only pub we saw nearby. We knew nothing about it before walking through the door. What we didn’t expect was 48 taps and nearly 100 bottle options! Half Acre Beer Company Daisy Cutter. Hint of grapefruit both on the nose and as an aftertaste. Jenn described the first few sips as earthy, blending into a citrus finish. Revolution Brewery Fist City. Wonderful citrus smell which carried flawlessly into the flavour. Bitterness was just right for someone like me who wants his hops to be the supporting cast. Within walking distance of our hotel was Howells & Hood. With 114 unique craft beers and a total of 360 beer taps, Howells & Hood made me downright giddy! The beer list took up half the menu and you have the choice of full glass or sample size. Our server, Mark, offered to make me a custom flight of Chicago brews to match my beer preferences. Revolution Brewing Eugene Porter. A malt lover’s paradise. Warm, smooth, chocolatey. Delicious! Revolution Brewing Bottom Up Wit. Almost no bitterness, this one has a wonderful orange smell and flavour. And is so smooth it’s like drinking silk…if silk were in beer form. It makes sense in my head! Metropolitan Brewing Dynamo Copper Lager. A lager that looks like an amber and tastes like something in-between the two. Lagunitas Brewing Co. A Little Sumpin’ Sumpin’. Comes in at 65 IBU, but the bitterness was well balanced. Not sharp like some IPAs. But also not purely citrus smoothness like some wheats. Bell’s Brewery Two Hearted Ale. A good beer that is subtle and smooth. Solemn Oath Brewery Snaggletooth Bandana. Grapefruit aroma, then bursting with both grapefruit and pineapple flavour. Between this and Two Hearted Ale, Jenn preferred Snaggletooth. A deep dish pizza is always on the list when visiting Chicago. And if wait times are a measure of deliciousness, then Giordano’s is a pizza of the Gods! Personally, I wanted to support Giordano’s because Mark Giordano (no relation to these Chicago pizza artists) is the captain of the Calgary Flames. But I decided against saying that in Blackhawks territory. The pizza was amazing at Giordano and well worth the 45 minute wait to have it made. Their tap options were limited, but local options are available. 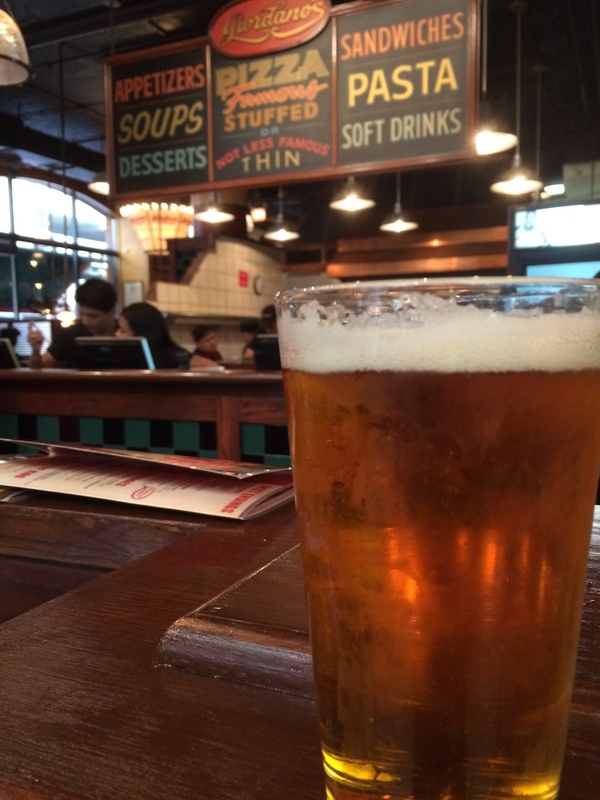 Lagunitas Brewing Co. IPA. This is an everyday IPA for the non-IPA drinker. The hops are definitely there but are also very well balanced with malts. We both had this one and equally enjoyed it despite having very different beer preferences. After a day at Wrigley Field, which was disappointedly lacking in independent craft beer options, we wanted a quick drink before settling in for the night. A tavern felt like the perfect choice. Pippin’s Tavern is only a few blocks west of the Magnificent Mile, but felt miles away once we got inside. Food was limited to takeout from adjoining Downtown Dogs, but the beer choices were quite good and we had some time feeling like university students again! Argus Brewery Pegasus IPA. A classic high hop IPA. The bitterness hits early and ends with an almost burnt flavour. If you’re a hop fiend, you should like this one! Brickstone Brewery APA. Lots of citrus hits your nose on this one. There was far less bitterness than the smell signaled. It was really enjoyable to drink and had more malty flavour coming through than I expected. The amazing thing was that craft beer is simply expected at all these types of establishment. We’re used to going out for food and needing to pick a place that actually carries a local option on tap. In Chicago, it felt like craft beer on tap is just a given. That’s our kind of town! 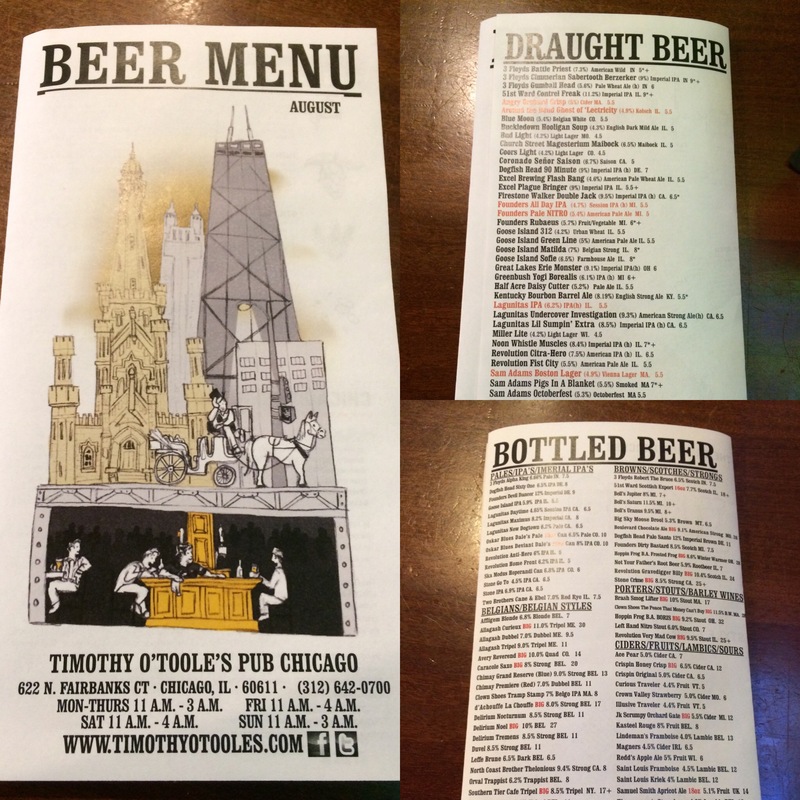 In the next post, I’ll delve into the many unexpected places around Chicago where a visitor can find craft beer. Stay tuned!